* ... MEADOWS FIELD: One of the passengers who nearly missed her flight at Meadows Field when the TSA baggage screening machine broke wrote with her version of that nightmare. Judy Lopez said it happened last Tuesday, May 31, as she tried to board the 6:20 a.m. flight to Phoenix aboard US Airways. She had high praise for the airline, which delayed the flight to try to wait on as many passengers as possible, but not for the TSA or airport management. "I was approximately 25th in the security line" an hour before her flight was scheduled to leave," she said. "After a half hour, I was still about 20th in line because the TSA agents were bringing people from the back of the line to the front. This included all passengers with special needs and there was no effort whatsoever to have a dedicated line for them, nor was there a dedicated line for those who had checked passage." She later learned it was the second day the machine had been down, and she wondered why airport director Jack Gotcher was not informed about it, and didn't move quicker to resolve the problem. "His comment that 'this is a TSA issue' is rather hollow." Some 30 people were left stranded at the Bill Thomas Terminal when the flight took off without them. These included passengers who arrived more than an hour early but failed to make it through security. * ... FIVE GUYS: My recent post that Five Guys Burger and Fries may be coming to Bakersfield triggered some mail from some rabid fans. Said Charlie Powell: "Richard, my wife and I got back Sunday after a two week trip to Virginia. While in Williamsburg we went to a Five Guys Burger place, after seeing a story about them on TV. We were more than impressed. We've always been In-N-Out fans, but Five Guys wins, hands down. The burgers reminded us of the homemade, grilled burgers from our youth. And, the fries are totally unique. The employees were very gregarious, and challenged us to compare them to In-N-Out. Clearly, Five Guys has a great business model, including employee devotion and loyalty. Bring it on!" 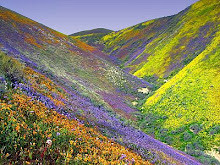 * ... BAKO SUMMER: It was Wednesday afternoon when I got the first taste that our long spring was about to end. 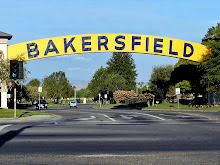 I was downtown and could almost taste the heat as I inhaled, a sure signal that the breezy porch days of spring are giving way to a Bakersfield summer. Valley heat has its own unique taste and smell, so different than other areas I have lived, and aside from the punishment I'll suffer from the utility's SmartMeter, I enjoy the long days of summer. Bring it on. * ... DID YOU KNOW? Did you know that in 1950 an architect named Wilson Call built the Oildale Post Office on a lot he had purchased from Justes Sheen for $3,500? Around the same time Call's uncle, Ralph Trout, sold his Twin Pepper's Beer Bar which was later demolished. 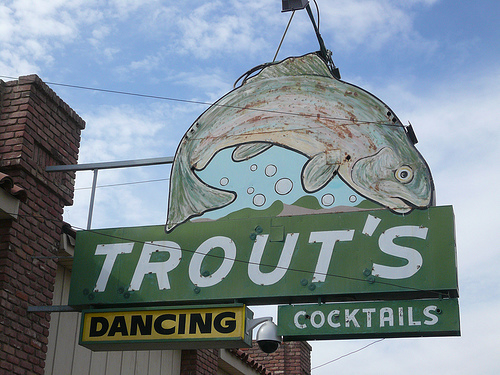 Trout then purchased a lot across the street and Call designed and built the building that houses Trout's bar at Chester Avenue and Lincoln Avenue. At one time Trout owned the famous Black Board bar, the Highland Bar and Trout's. Thanks to retired architect Wilson Call, now 95, who submitted this bit of history. * ... MAYFAIR MARKET: Longtime contributor Don Kurtz responded to an earlier post about the old Mayfair Market in Oildale. "My father, Frank Kurtz, was the manager for many years. I won't say it was the center of Oildale but close. 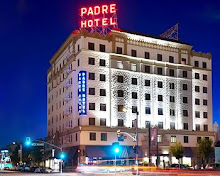 Almost all of the employee's resided in Oildale. The ice cream parlor was owned by Jim Harris and his family. They produced just about everything you needed for a party from ice cream to punch. I was 14 at the time and remember they had the cutest daughter! In the Mayfair there was also a lunch counter were everyone hung around. I remember the ranchers coming down from Woody and adjoining areas for their weekly load of groceries. Had my first real job setting up and selling Christmas tress in the parking lot. Was only 15 and it took me months to get the sap off of my hands! At that time anything you needed could be purchased in Oildale." * ... HISTORY DAY: Fruitvale Junior High School has a long and distinguished tradition of achievement in the History Day competition, and they are at it once again.Writes Dan Jenson: "I thought you might be interested to learn that six students from Fruitvale won California State History Day championships and are leaving this weekend to participate in the National History Day contest at the University of Maryland. Our friends' son, Christopher Trickey, will be competing in the individual documentary category, while Julie Marie Castro, Morgan Kaess, MaKay Moss, Grace Yaesel Park and Brooke Richter will be competing in the group performance category. In addition, two other children from the district, Jessica Jensen, (my daughter) and Cassidy Porter, both from Endeavour Elementary School, won state championships but won't be competing as the elementary division is not eligible for nationals. The Fruitvale district has been extremely successful in this competition over the years, and it's no accident. With coaches like Mrs. Rowena Moore at Endeavour, the kids do things most of us could never even dream about. I mean, what do you say when President Carter's chief-of-staff calls your house and asks to speak to your ten-year-old daughter? It's absolutely amazing!" Hats off to these high achieving kids. 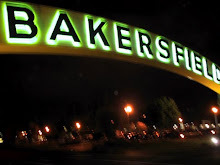 * ... BAKERSFIELDISM: You know you're from Bakersfield "if you ever snuck friends into the Crest Drive-in in the trunk of your car." Lincoln Avenue is in Oildale. Lincoln Street is in east Bakersfield, near Union Avenue & Bernard Street. Lincoln Avenue is in Oildale. Lincoln Street is off Union Avenue near Bernard Street.